China says it has informed Myanmar about a military drill to be held later today in the border area between the two countries. Military authorities say the drill will involve troops from China's armed forces and Air Force. The Foreign Ministry of China said on Monday that the drill is scheduled in accordance with the military's regular training plans. 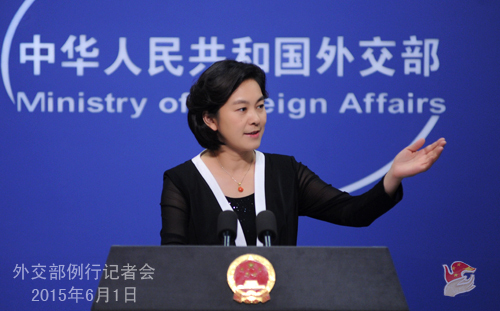 Meanwhile, Foreign Ministry spokesperson Hua Chunying also urged combatants in Myanmar to alleviate tensions in the country's north and to protect peace and stability in the area along the Chinese border. "Situations in north Myanmar affect the peace and stability in the China-Myanmar border area. China urges the relevant parties in Myanmar to show restraint, prevent escalation of the conflict, and alleviate tensions to avoid damage to the security and order of the China-Myanmar border area. We hope Myanmar will make joint efforts with China to protect peace and stability in the border area, and to promote healthy and stable development of bilateral ties." Conflicts in northern Myanmar have lasted more than three months and bombs from Myanmar have fallen into Chinese territory several times. Eight Chinese have died in those bombings. China said it has informed Myanmar about a military drill to be held later today in the border area between the two countries. The drill will involve troops from China's armed forces and Air Force.